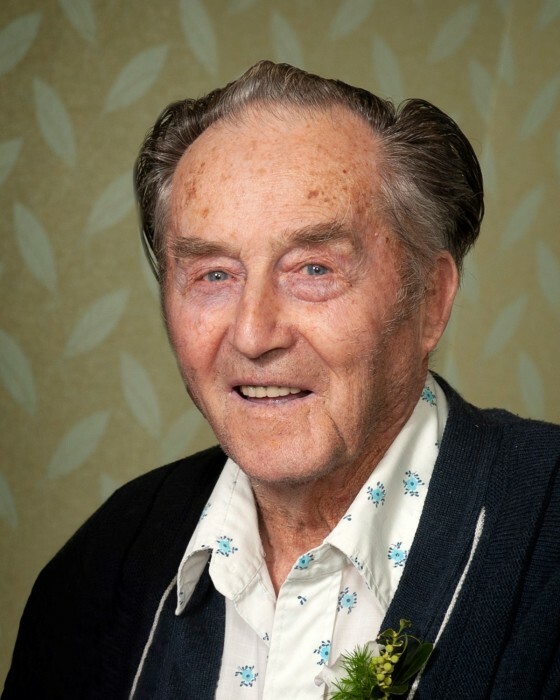 Sigvald “Sig” Jordheim, age 97, passed away in the early morning of Thursday, March 28, 2019 in the Kyle Health Care Centre, Kyle, SK. Sigvald Oscar Jordheim was born September 8, 1921 in Kyle, SK — the third child of Knut & Camilla (Melbo) Jordheim. Sig received his early education at Horse Butte school and roaming the river hills near their farm home. It was in the latter that he developed his fascination with birds and other wildlife that lead him to become “an outstanding prairie farmer and naturalist,” as cited in the award granted him by the 1998 Prairie Conservation and Endangered Species Conference. In his youth he hunted and trapped, but soon abandoned those activities to devote his attention to understanding and preserving the wild creatures and their habitat. He worked for the Hesla and Shaw ranches and for neighbours Donald & Lottie MacPherson, before renting and finally purchasing their farm. Over the next 50 years he changed the nature of that farm, planting miles of tree rows, and created ponds and dams. He grew a variety of crops, raised cattle, and in most years the farm yard was filled with various species of chickens, ducks, geese, turkeys, and his favourite, peafowl — at times, having as many as 30 of the large birds. He was not alone in these endeavours. On March 27, 1945 Sig wed Ruby Bodrug, his wife and partner for his next 74 years to the day. Over the years, five children would join them. Sig & Ruby were active off the farm as well and were members of the Swift Current SDA church from its establishment. Sig helped with repairs on the church building, served as a deacon for several years, and when the church built the Swift Current Nursing Home, served on its Advisory Board. He sat on local school boards for many years and served the RM of Lacadena as pest control officer for Division 2. He would often sadly point out the number of farm yards that turned into open fields over the years. Sig was always available to lend a hand to help his neighbours, even when it took him from important work at home. After a disappointing trial at irrigating hay land, he put his pumping equipment to good use moving water to fill dugouts in dry years, thus helping the neighbours while earning a little needed cash. He was proud of having pumped water at over 80 farms. When the children joined 4H, Sig became a leader — first in the beef club, then for years as leader of a Conservation Club, introducing youngsters to his love of nature. He was a life-long member of Nature Saskatchewan, an early and life time member of the Kyle Fish & Game League. He spent many hours helping some of Saskatchewan’s best-known naturalists locate nestlings for banding and was acknowledged for his contribution towards the creation of The Birds of the Elbow and Birds of Saskatchewan publications. He contributed numerous articles to Nature Saskatchewan’s “Blue Jay” as well as writing a popular “Natures Notes” column in local papers. In his 70’s, Sig developed colon cancer. Early detection allowed a good chance of full recovery, only to have a serious setback from surgical complications. But he rallied from that and went on for another twenty years. Eventually, however, cancer returned, and combined with the ravages of time, led to the end. Sig is survived by his wife, Ruby; his sons, Cam (Ylonda), Darryl, Bryan (Darlene), and Gary; his daughter, Lynette (Greg); his grandchildren, Kurt (Valene), Elijah, Aislinn, and Keely; his great-grandchildren, Rylan, Olivia, and Erika; his brother, Floyd; his sisters-in-law, Margaret and Velma; his brothers-in-law, Jerry and Morris; and by numerous nieces and nephews. Sig was predeceased by his parents, Knut & Camilla; his brothers, Ronald, Andrew, and Kenneth; his sister, Anna; his sisters-in-law, Viola, Shirley, Alice, Elma, Almeda, and Jean; and by his brothers-in-law, Jim, Evan, Lloyd, and Charles. The Funeral Service for Sigvald “Sig” Jordheim was held on Friday, April 5, 2019 at 10:00 am from the Seventh Day Adventist Church, Swift Current, SK with Pastor Scott Manly officiating. “Shall We Gather at the River” and “When the Roll is Called Up Yonder” were sung by the congregation, with Dawn Clark serving as organist. The eulogy was given by Sig’s family. The Interment Service was held from the Horse Butte Cemetery, Kyle, SK with Greg MacCulloch, Elijah MacCulloch, Laine Jordheim, Dan Zazelenchuk, Glenn Cates, and Tyler Hope serving as Pallbearers. Honorary Pallbearers were all those who shared in Sig’s life. A luncheon was held at the Kyle Legion Hall following the Interment Service. In memory of Sigvald “Sig” Jordheim, donations made to the Kyle and District Health Foundation and Nature Saskatchewan would be appreciated by the family.